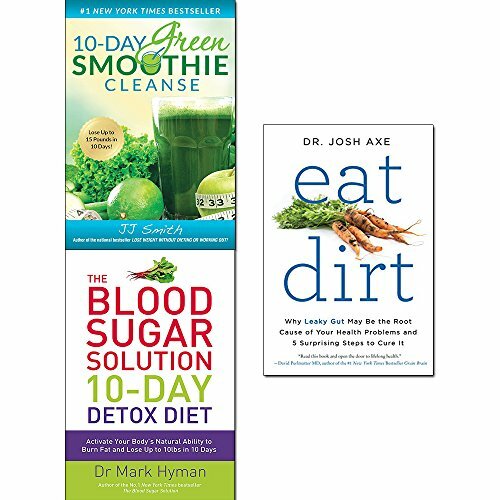 10-day green smoothie cleanse, blood sugar solution 10-day detox diet and eat dirt 3 books collection set. Description:- 10-Day Green Smoothie Cleanse 10-Day Green Smoothie Cleanse will jump-start your weight loss, increase your energy level, clear your mind, and improve your overall health. Made up of supernutrients from leafy greens and fruits, green smoothies are filling and healthy and you will enjoy drinking them. Your body will also thank you for drinking them as your health and energy improve to levels you never thought possible. It is an experience that could change your life if you stick with it! The Blood Sugar Solution 10-Day Detox Diet: Activate Your Body’s Natural Ability to Burn fat and Lose Up to 10lbs in 10 Days Dr. Hyman’s revolutionary weight-loss programme, based on the #1 New York Times bestseller The Blood Sugar Solution, supercharged for immediate results. The key to losing weight and keeping it off is maintaining low insulin levels. Based on Dr. Hyman’s groundbreaking Blood Sugar Solution program, The Blood Sugar Solution 10-Day Detox Diet presents strategies for reducing insulin levels and producing fast and sustained weight loss. You can lose up to 10lbs in 10 days! Eat Dirt: Why Leaky Gut May Be the Root Cause of Your Health Problems and 5 Surprising Steps to Cure It Most Americans live a “germ-free” lifestyle, sanitizing and scrubbing every surface, eating processed and pasteurized food, and slathering on anti-bacterial gels. But while our homes and hands may be clean, our health is taking a hit. Starved of actual nutrition and overtaxed by chemicals, stress, and excessive antimicrobial use, we are developing microscopic tears in our intestinal walls.